This book is on my press. I tend to write notes on books from my press because I often read those books. 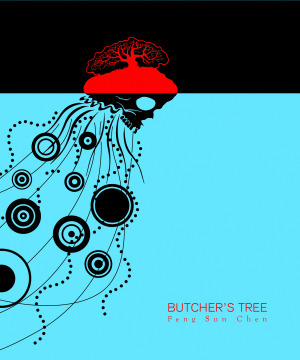 Reading Butcher’s Tree, it seems like Feng Chen can do just about anything (I mean in poems). While it would be easy to pigeon-hole this work within veins of poetry that are working to trouble conceptions of the body, gender, and humanness and Feng’s own interest in Post-Human poetics, this is I think to miss out on a lot. What more it is or might be I can’t describe good but maybe better through these notes. through bones made of shale. One can see the other’s rage. This poem proposes the land as bodied and the body as land. Though these equivalencies aren’t the ultimate point. The body is more—it is itself changing places with itself, the heart growing bones, the seat of the human ‘spirit,’ moved closer to that which tears, grinds and is not alive, the portals of the body. That there are also two hearts—the body itself lacking a center or cohesion. Webbed, sticky rage: Constellations, networks, structures without centers. An image used to assert a particularly contemporary sense of being, resulting, and causing. Metaphysics? I first encountered this like most in Benjamin in the form of a constellation where what is important are the points and that which connects them is the mind perceiving relations. I don’t know Deleuze and get the rhizomatic thing second hand but it seems like these constellations planted. Roots, though, are often dry. Here they are sticky, viscous, the web which doesn’t bring forward a plant but is simply a mesh converting life to unlife and so on. The stickiness of the web that catches things is elaborated on in a collection full of membranes, messy efflorescences, pulp, reaching its climax in the absurd, powerful “Neon Parade” where the poem paints the reader as a clown proceeding down a world saturated with rain on stilts that sink further and further into the mud with each step, each step. Here Chen moves closer to the visqueux–another concept I am probably mangling—a vision of the world as “an undifferentiated gelatinous mess.” There’s a doubleness here: both a radical assertion of a world view and a sly commentary on the act of reading? I’ve been wondering where these slimy assertions of the world are coming from. They appear also in the torrents and hypersaturations of Blake Butler’s Scorch Atlas. Lightning through jello. I could put forward a lot of dumb theories of my own but I’ll go with what the book itself provides in the poem “The Living” which opposes the potato like fact of a body—“My true face is that of a potato. I have many eyes, but see nothing”—that perceives in a multifaceted, decentralized way (and not through sight) to a skepticism of sight—“I am afraid too much sight can kill me” (43) and perhaps sight-based knowledge –“I drink with my eyes. When I try to explain anything, some part of something, somebody dies.” This situation, the roving, eye is basically the internet: “Eyes are like rubber tires. They take you places. / Do a lot of traveling. I try not to puncture mine, but they leak. / My great fear has always been immediacy. / Being pulled from a vapor state to the body world” (50). Make conclusions from this. There’s great facility here, a movement between forms and syntaxes, assertions and indirections, and sympathy for how people want to see things that makes everything I’m typing wrong. Step 2: read it, then. I was going to order this some time back, but I managed to forget about it. It looks fantastic. Hey Harrison–Yeah, it’s worth checking out. PS. If you do, let me know what you think.